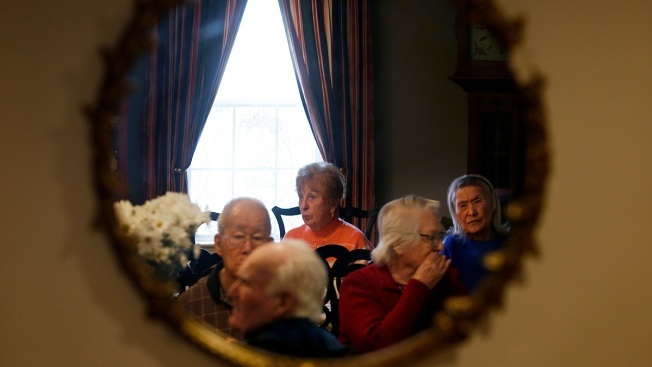 Clients at the Julia Ruth House Adult Day Care Center enjoy high tea together in Westwood, Mass., on March 21, 2019. The Cambridge biotech company Biogen announced Thursday that it is scrapping tests on an experimental treatment for Alzheimer's disease, dashing hopes among advocates and caregivers for a medication to tame the devastating illness. Biogen, the largest biotech based in Massachusetts,and its Japanese partner Eisai said they were halting two late-stage clinical trials of the drug after concluding it was unlikely to benefit patients. The news sent Biogen stock into a free fall, with the company losing a staggering $18 billion of its value Thursday. With the setback, Biogen joined a long list of drug firms that have tried and failed to develop successful treatments for Alzheimer's. New Jersey resident Jeff Borghoff was left heartbroken when he heard the news the experimental treatment was unlikely to work. Biogen joins a long list of companies in the last decade who have failed to find a treatment for Alzheimer’s. Every month, a car would pick up Jeff Borghoff at his home in Forked River, New Jersey, and drive him to the Advanced Memory Research Institute of New Jersey. There, doctors would help him settle into a comfortable chair and hook him up to an IV. For the next 40 minutes to an hour, an experimental treatment aimed at slowing Alzheimer’s disease called aducanumab would flow into Borghoff’s veins. He would post a picture online encouraging other Alzheimer’s patients to enroll in clinical trials. Doctors would check for any side effects before sending Borghoff back home. This was Borghoff’s routine for nearly three years. He and his wife Kim felt like the treatment was working. Then on Thursday, Borghoff received a Facebook message from one of his friends who was also enrolled in the aducanumab trial asking if he had heard the bad news. “I just knew right away. It was a gut feeling, sixth sense kinda thing,” said Borghoff, 54, who was diagnosed with Alzheimer’s at 51. The Cambridge, Massachusetts-based biotech giant joins a long list of companies in the last decade that have failed to find a treatment for Alzheimer’s, a progressive and debilitating disease that often affects a person’s memory, thinking and behavior. Biogen and Eisai lost billions of dollars in market value. The scientific community viewed the announcement as a setback after spending billions to research and develop possible treatments — with almost nothing to show for it. Patients and families living with the disease who had pinned their hopes on aducanumab were heartbroken. This failure is just the latest in a string of experimental treatments targeting a protein-fragment in the brain known as beta amyloid. Many scientists and drugmakers think it plays a prominent role in the devastating disease by eroding synapses between nerve cells. Some trials are already underway to test other ways of attacking Alzheimer’s. Salim Syed, senior biotech analyst at Mizuho Securities who covers the stock, said Biogen’s failure was a shock to many as the Alzheimer’s treatment showed promise and followed the widely accepted theory that beta amyloid was responsible for the disease. “The challenge now is we’re back to the drawing board when it comes to Alzheimer’s,” Syed contended. Alzheimer’s disease can cause people’s memory and mind to deteriorate to the point where they cannot function on their own and eventually die. It’s the sixth leading cause of death in the U.S., and the Alzheimer’s Association estimates 5.8 million Americans are living with the disease. More than 16 million Americans care for someone with Alzheimer’s disease without pay, an experience that can be intensive and emotionally taxing. This year alone, Alzheimer’s and other dementias will cost the U.S. $290 billion, according to the Alzheimer’s Associations. Despite the disease being common and its effects and challenges being well-documented, scientists don’t know much about it. They don’t know what causes Alzheimer’s nor do they understand how exactly the disease works, making it challenging to find ways to treat or cure it. The FDA has approved four Alzheimer’s drugs, all of which are aimed at helping symptoms, not actually reversing or slowing the disease itself. That’s not to say people aren’t trying. The National Institutes of Health alone expects to invest $1.46 billion on Alzheimer’s research this year, almost three times the $562 million spent in 2014. “Our brain is a complex organ and this is a complex disease,” said Heather Snyder, senior director of medical and scientific operations for the Alzheimer’s Association. Kim Borghoff wanted her husband Jeff to screened for the disease after he started “zoning out” for no apparent reason, she said. His father, uncle and other relatives had Alzheimer’s and she wasn’t buying his diagnosis of epilepsy. She called Columbia University Medical Center every day, twice a day until she got an appointment, having already tried other hospitals. They ran numerous tests. About 18 months after first trying to get a diagnosis, Kim finally had the answer. She was sitting at her desk when the doctor called. “She said, ‘I’m sorry to tell you, Jeffrey has Alzheimer’s. All the tests came back and he’s early in the stages. Get your affairs in order,”’ Kim recalls the doctor saying. She drove home and on the way back called Jeff to tell him they were going to the park. She told him not to ask any questions or say anything to his mother, who was living with them and caring for her husband who had Alzheimer’s. They drove to the park and sat on a bench where she told him the news. “He broke down. I broke down. Then he said i’m going to fight this and he’s been fighting this ever since,” she said. That was three years ago. From 1998 to 2017 there have been about 146 unsuccessful attempts at developing drugs for Alzheimer’s disease, according to the Pharmaceutical Research and Manufacturers of America, or PhRMA, the industry’s main trade group. That means for every research project that succeeded to yield a new medicine, about 37 failed. Major drug companies such as Pfizer, Johnson & Johnson, Eli Lilly and Merck have ended their attempts to treat Alzheimer’s by targeting beta amyloid after failing to produce good results. In January, Swiss drugmaker Roche announced that it was ending two-late stage trials for Alzheimer’s that also targeted beta amyloid. It’s still testing another amyloid drug at a higher dose. Dr. Richard Mohs, a former head of Eli Lilly’s Neuroscience Clinical program, said “as a field, we may need to move on and look at other scientific plausible ways to try and treat the disease” besides amyloid-targeting drugs. Jeff Borghoff was gardening, his new hobby after he had to leave his job as an IT architect, one day when his new neighbor walked over. Jeff mentioned his Alzheimer’s diagnose and his neighbor said sure enough, his wife had just started working for the Advanced Memory Research Institute. Once Jeff connected with the center, researchers determined he was eligible for the aducanumab trial. Jeff and Kim were “so excited,” she said. The first 18 months was a double-blind placebo study, meaning Jeff didn’t know whether he was getting the treatment or the placebo. Then they revealed he was receiving the treatment. He and Kim felt like it had slowed the progression of the disease, though they have not seen any of the results. Jeff knew that since this was an experiment, the treatment could fail and the drugmaker could end the trial at any point. Still, he and his family were not quite prepared for it to really end. Even though recent experimental treatments haven’t produced any new drugs, they still have helped researchers learn more about the brain and the disease, Snyder said. Scientists are starting to understand that a person’s brain starts to change about a decade or so before they’re diagnosed with Alzheimer’s disease. The Borghoffs called a family meeting Thursday night. Jeff, positive as always, said he wanted to find another clinical trial to enroll in so he could help scientists find a treatment or a cure that might help his kids or grandkids. Kim wants him to try medical marijuana or CBD oil. She hopes these options might quell the anxiety and anger Jeff increasingly experiences. However, neither have been approved by the FDA to treat or manage Alzheimer’s or other dementias, nor have they been evaluated in clinical trials. It’s also unclear how people with dementia would respond to the psychoactive effects of marijuana or how it would interact with the other drugs used to treat the desease.